The Toorak Handicap is one of the key mile features of the Melbourne Spring Racing Carnival and runs over 1600m at Caulfield Racecourse on Ladbrokes Caulfield Guineas Day in mid-October each year. On a meeting that is headlined by four Group 1 races, the Toorak Handicap is worth $500,000 in prize money and was first run in 1881 when Josephine won the inaugural edition. Open to horses aged three-years-old and above it has held Group 1 status since 1979 and is traditionally contested by horses that come via a lead-up run at the track in the Group 1 Sir Rupert Clarke Stakes (1400m). Trust In A Gust (2014) was the last horse to do the Sir Rupert Clarke – Toorak Handicap double. The other elite level races that run alongside the Toorak Handicap at the meeting are the: Group 1 Ladbrokes Caulfield Guineas (1600m), the Group 1 Thousand Guineas (1600m) and the Group 1 Ladbrokes Caulfield Stakes (2000m) for possible Cox Plate horses. Notable Toorak Handicap winners over the years include Royal Gem (1946), Galilee (1966), Leilani (1974), Roman Arch (2003), More Joyous (2010) and recent dual champ Solzhenitsyn (2012 & 2013). This year the 2018 Toorak Handicap ran on Saturday October 13, 2018. Toorak Handicap betting markets are traditionally led by horses that ran in the Group 1 Sir Rupert Clarke Stakes (1400m) at the same track, which has produced five of the six winners from 2012-17 including Trust In A Gust (2014) who completed the double. Previous experience over the mile also bodes well for horses at the top of the Toorak Handicap odds. Favourites in the Toorak Handicap betting odds have a solid record in the race over the past decade with four saluting for the punters from 2010-17 including He’s Our Rokkii ($2.60 in 2016). Upsets though are also not uncommon with the longest priced Toorak Handicap winner in recent history being Allez Wonder ($41 in 2009). The updated Toorak Handicap 2018 betting odds complete with links to our Group 1 Ladbrokes Caulfield Guineas Day markets will be available below as soon as open so stay tuned for the best mile racing odds online. Toorak Handicap tips that are the most likely to pay off are to take the best performers coming out of the Sir Rupert Clarke Stakes. In 2012 and 2013 Solzhenitsyn ran third in the Sir Rupert Clarke Stakes before his back-to-back Toorak victories, while Trust In A Gust won both races in 2014. Other Toorak Handicap tips are to take a runner drawn in barrier 11, which produced two of the past four winners from 2011-2014, and look for the four-year-olds who have a dominant recent record in the Toorak Handicap results since 2005. Our Ladbrokes’ exclusive Toorak Handicap 2018 betting tips will be detailed below the week of the race so stay tuned for the milers to get behind at the best value Caulfield odds this spring. The Toorak Handicap field has a capacity of 18 starters, that maximum last lining up in 2008 when Alamosa won the classic. It is a race known for its big fields with no single figure fields lining-up in over 30 years. Final Toorak Handicap acceptances are taken on the Wednesday before the race and feature the best milers of the season. The nominations for the race close the Monday two days out from the field and barrier draw release every October. 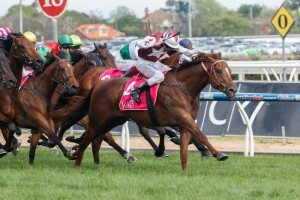 Trust In A Gust (2014) completed the Sir Rupert Clarke Stakes – Toorak Handicap double. Photo Credit: Race Horse Photos Australia. Horses traditionally come into the Toorak Handicap field via a lead-up run in the Sir Rupert Clarke Stakes and may continue onto the Melbourne Cup Carnival to contest later Group 1 features including the Group 1 Emirates Stakes (2000m) run at Flemington on the Saturday after the Melbourne Cup. The official Toorak Handicap 2018 Final Field & Barriers are set for release on the Wednesday leading-up to Ladbrokes Caulfield Guineas Day and will be listed in full below so stay tuned to see what gun spring milers make the field. The official Toorak Handicap 2018 nominations are taken on the Monday of race week, unlike those for the Ladbrokes Caulfield Guineas and Thousand Guineas at the same meeting that close in early August. The Toorak Handicap form guide features all the crucial information like saddlecloth numbers, jockeys, trainers and the allocated weights of all the horses in the field. Looking for horses that ran first three in their lead-up run is important as the Toorak Handicap form shows that gallopers that finished in the money last time out have the best record in the Group 1. Wide gates have produced as many winners as inside gates over the past decade. The Toorak Handicap results and finishing order of all starters is known when the event runs as Caulfield Race 7 on Caulfield Guineas Day. You can find out the winner, quinella, trifecta, first four as well as the winning margin for any exotic bets placed on the spring major. The full Toorak Handicap 2018 Results & Finishing Order will be detailed below when the race takes place on 2018 Ladbrokes Caulfield Guineas Day, Saturday October 13, 2018.